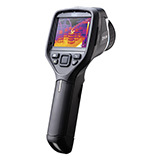 This Ultimate Kit not only includes the quality equipment found in our other kits, but also a state-of-the-art thermal imager from FLIR to give you the ultimate in inspection equipment. This kit will impress your customers and give you another valuable tool to use in your inspection and/or remediation business. This package includes the Bio-Pump Plus, a flow indicator, battery charger, 10 Air-O-Cell cassettes, 25 Bio-Tapes, heavy-duty tripod stand, bio-isolation filter, all in a heavy duty carrying case. Extech/Flir MO295 Pinless Moisture Psychrometer! 8-in-1 Meter with Patented Built-in IR Thermometer Monitor moisture in wood and other building materials with virtually no surface damage with the Pinless Moisture sensor (Pin-type Moisture Probe included). Measure Humidity and Air Temperature with built-in probe plus non-contact InfraRed Temperature with patented IR design. Built-in Humidity/Temperature probe measures Relative Humidity, Air Temperature plus Grains Per Pound (GPP)/(g/kg), Dew Point (DP), Vapor Pressure, and condensation point. Extech/Flir BR200 Video Borescope/Wireless Inspection Camera! This 17mm camera diameter and 3.5" Color TFT LCD Wireless Monitor with a 2GB microSD memory card (included) for capturing images (JPEG) or video (AVI) for viewing on your PC using Windows Multimeda Player. Flir e4 Compact Infrared Camera with MSX®! Now you can afford the ultimate inspection tool. Gain the competitive advantage and take care of more customers. Blow them away with dramatic MSX thermal images that clearly reveal problems from sources of energy loss, moisture intrusion and structural issues to overheating electrical and mechanical equipment.